Photographer courtesy Tom Sutch. D5291 at Springs Branch during July 1971. Whilst the locomotive has acquired full yellow ends, it looks like the rest of the locomotive is carrying the remnants of the paint received when it was outshopped new from Derby during 1964. The exhaust location has not yet been changed. The eighteen year career of D5291/25141 was spent allocated to only London Midland Region depots. Boiler room grilles sheeted over (1978). Time between last Classified repair and withdrawal: 53 months. Time between withdrawal and scrapping: 52 months. September 1964 to Derby (16C). October 1964 to Cricklewood (14B). January 1965 to London Division (D14). September 1965 to London Midland Midland Lines (LMML). April 1966 to Nottingham Division (D16). March 1967 to London Midland Midland Lines (LMML). November 1967 to Stoke Division (D05). November 1968 to Liverpool Division (D08). October 1976 to Springs Branch. 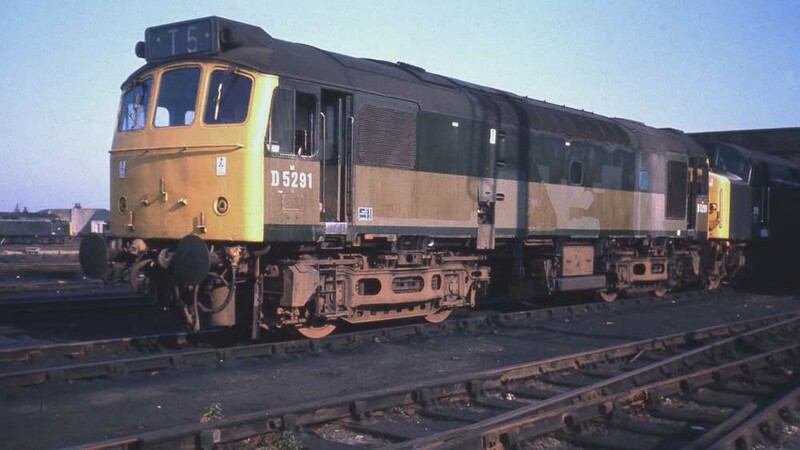 25141 was the 137th Class 25 to be withdrawn, one of three retired during September 1982. After withdrawal 25141 was stored at Longsight until January 1983 when it moved to Springs Branch, remaining here until June 1984. 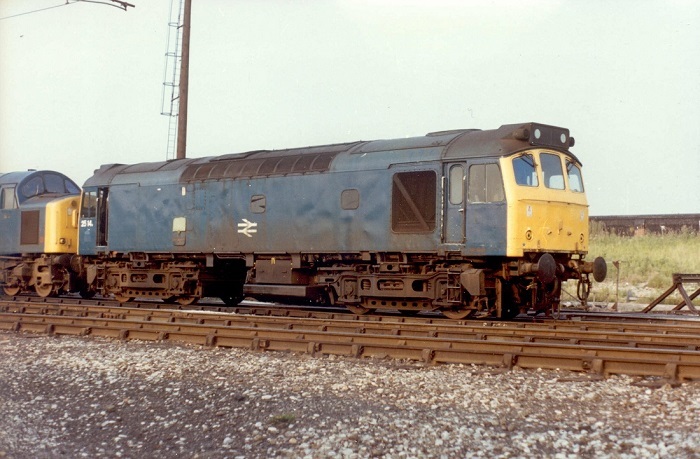 On June 27th 1984 25141 moved to Swindon and was scrapped there by late January 1987. Noted Crewe Works November 1968. Noted Derby Works June 1973. Noted Derby Works March 1978 (Classified). On May 11th 5291 & 7513 were noted at Eastbourne with a day excursion from Bradford, presumably working out & back. On June 11th 5291 & 7500 worked the 08.36 Nottingham - Llandudno Town and the return. About a month later on July 9th 5291 & 7563 worked the 08.36 Nottingham - Llandudno Town and return. On January 14th the 10.40 Glasgow Central - Birmingham New Street failed at Preston behind Class 40 No.310, 5291 & 5212 were on hand to work the train forward to Crewe and possibly Birmingham New Street. The 13.50 Derby - St. Pancras was worked to Leicester by 5291 & 5246 on December 14th. On July 22nd the 11.30 Poole - Newcastle was worked forward from Reading to Birmingham New Street by 25141 & 25248. A St. Pancras - Southport day excursion on February 1st was worked roundtrip between Wigan Wallgate & Southport by 25141 & 25049, replacing 45077. On May 31st 25141 & 25209 worked the 09.20 Manchester Piccadilly - Yarmouth to Lincoln Central, returning from there with the 09.30 Yarmouth - Manchester Piccadilly. On August 23rd 25141 & 25189 handled the same diagram. The 22.35 York - Manchester Victoria was worked by 25141 on August 29th (August 28th departure?). On September 3rd 25141 worked a Clitheroe - Hexham cement train. Cambrian metals were visited on June 3rd with 25141 & 25156 working the 10.40 Euston - Aberystwyth from Wolverhampton, returning with the 16.10 Aberystwyth - Shrewsbury, although 25141 was not noted on the empty coaching stock movement from Shrewsbury. 25141 was stabled at Saltley at noon of August 8th. The 07.30 Nottingham - Llandudno Town and 13.02 return to Nottingham wwere worked by 25141 on August 12th. A week later (19th) 25141 worked the 19.30 Crewe - Cardiff and on August 21st the 12.25 Crewe - Cardiff. Photographer courtesy Roger Thomas. 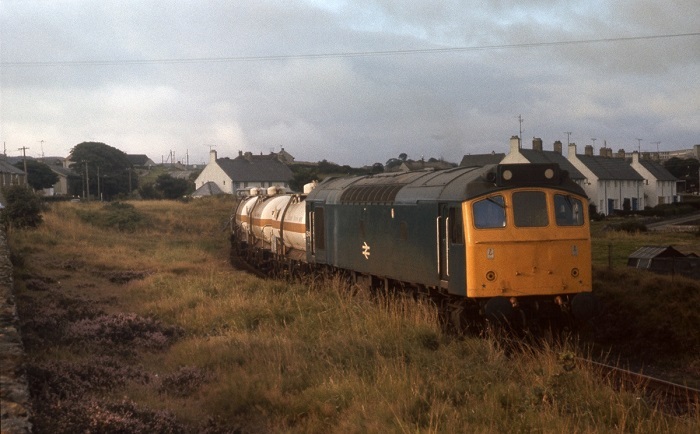 25141 at Amlwch on August 25th 1978 in charge of the Octel tanks. The locomotive is not too long out of Derby Works, despite the ever present water stains close by the radiator screen. 'The Pennine Rose' railtour on May 5th saw 25141 & 25129 work the Marylebone - Birmingham New Street and the return Coventry - Marylebone legs, a total of 233 passenger miles. The 04.15 Shrewsbury - Aberystwyth and the 10.09 Aberystwyth - Euston to Wolverhampton were worked by 25141 & 25032 on July 7th. The next day (8th), the same pair worked the 08.45 Birmingham New Street - Barmouth, returning with the 17.45 Barmouth - Euston to Wolverhampton. On July 20th 25141 worked the 15.15 Plymouth - Manchester Piccadilly between Gloucester & Birmingham New Street, being banked up Lickey by 37217 & 37231. A week later on July 28th the Derby - Norwich - Yarmouth - Norwich - Walsall diagram was worked by 25141 & 25110. On August 8th 25141 was noted in the Reading area with a weed killing train. On August 17th an engineers special was worked from Bescot to Hitchin by 25141, returning equipment used in the Bushbury accident cleanup. The 10.10 Euston - Aberystwyth from Birmingham New Street and the return 16.10 Aberystwyth - Shrewsbury were worked by 25141 & 25145 on August 11th and by 25141 & 25274 on September 15th. On April 24th 25141 & 25173 worked the 'Up' & 'Down' Stirling motorails between Kensington Olympia & Willesden. The 08.40 Carlisle - Glasgow Central was worked by 25141 on June 1st. Near the end of the month on June 27th a Blythe Bridge - Llandudno Town relief was worked by 25141 & 25206 (out and back?). On June 29th 25141 was noted northbound at Blea Moor with a train of short wheelbase flat wagons. On March 13th the 13.15 Birmingham New Street - Norwich was worked to Leicester by 25141, where 31313 took over. Cambrian metals were revisited on May 29th/30th. On May 29th 25141 & 25062 worked the 10.10 Euston - Aberystwyth from Birmingham New Street, returning with the 16.05 Aberystwyth - Shrewsbury. The next day (30th) the same pair worked the 08.45 Birmingham New Street - Aberystwyth from Shrewsbury, the 16.40 Aberystwyth - Machynlleth and the 17.25 return and the 18.15 Aberystwyth - Euston to Wolverhampton. On August 9th (1982?) 25141 was noted in the Reading area working a weed killing train. On August 21st 1982 25141 was noted on a Banbury - Bescot freight. 25141 & 25245 worked the 07.38 Shrewsbury - Aberystwyth and the 10.07 Aberystwyth - Euston to Machynlleth on August 28th. 25141 failed at Machynlleth and was replaced by 25307. It is most likely this was 25141's last passenger working. 25141 was withdrawn on September 19th 1982. Photographer collection of webmaster. Another view of 25141 at Springs Branch, date unknown, but presumably after its withdrawal. Page added October 3rd 2012. Last updated February 26th 2019.